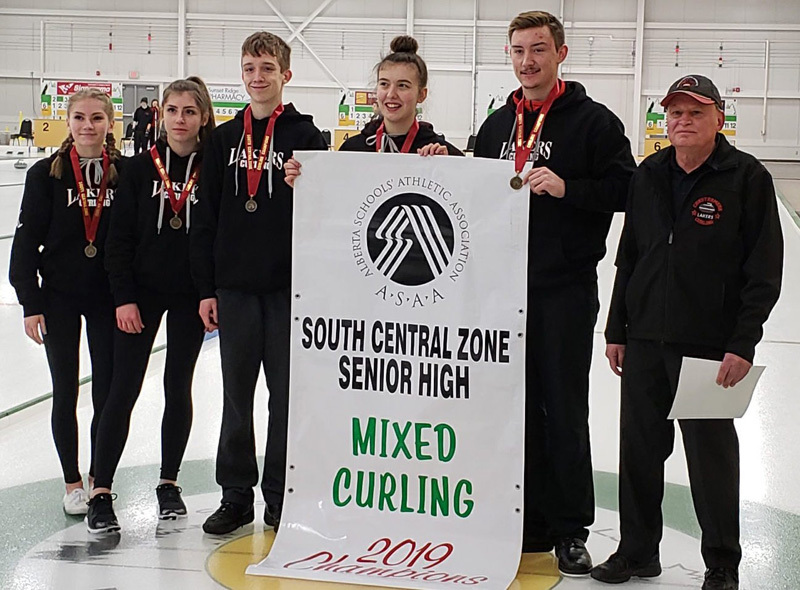 History was made, this past weekend, as CHS’s mixed curling team won the first ever curling South Central Zone Championship. Congratulations to all athletes and coaches. The curling team had a busy week, starting on Wednesday at Divisionals in Airdrie. The mixed team of Cole Lewis, Christina Maida-Cook, Jordan Faucher and Shae Doughty competed very well and advanced to the zone championships. The girls team of Sara Brown, Rachelle Faucher, Tori Brown and Mackenzie Schmidt won their first game against George Macdougall, but came up against a tough Cochrane team in their second game, which finished their season. On Friday the mixed team of Cole Lewis, Christina Maida-Cook, Redmond Everett, Sarah Brown and Tori Brown travelled to Cochrane for Zones and came out strong winning their first two games. Saturday morning they lost to a strong Strathmore team. They finished second in their pool, which advanced them to the medal round. They won their first game against WG Murdoch and this put them in the gold medal game, once again against Strathmore. The team played great and were victorious winning 7-1, advancing them to Provincials in St. Paul in March. Good Luck and Go Lakers. Thanks to Coach Janke and Bremer. The Lakers were in Edmonton this weekend to take part in the prestigious Harry Ainlay Tri Prov tournament. The Lakers has a competitive game with the Raymond Comets eventually losing 94-68 on Thursday afternoon. Friday evening the Lakers lost a close contest to Edmonton Christian 73-69. Saturday the Lakers finished the tournament on a positive note knocking off the Oak Park Raiders from Winnipeg 83-80. Logan Bennett, Luke Mans and Jaxon Kolesar-Lafaut each won player of the game awards. This tough competition will help the Lakers as they prepare for playoffs. The team now looks forward to closing out their tournament schedule at the Falcons Classic hosted by Foothills Comp this weekend. Go Lakers! 3-pointers in the game. Paige Grabmuller, Shaelynn Doughty and Amy Alexander had strong defensive games. Chestermere then headed to Red Deer to play in the Lindsay Thurber Tournament. The Lakers, short some players, lost games to Lindsay Thurber and Bishop Grandin. In their last game of the weekend, the Lakers played Grande Prairie and were able to come out with a win to finish the tournament. This weekend the girls host the 34th annual Chestermere Invitational. The JV girls ended the league season off with a hard fought loss against Bow Valley last Wednesday evening. The girls played hard, but weren’t able to come through with a win. They will take that hard fighting attitude into the Chestermere Invitational Tournament this weekend. Player of the week was Brittany Thurlow. The CHS Athletic Field Upgrade committee is working hard to raise funds for the project. Our goal is to have the field turf installed for September 2019. This is a joint school/ community project. Anyone wishing a sponsorship package send me an email and I will forward to you. We are doing a presentation to the city of Chestermere on Tuesday. There will be a social media campaign unveiled in the next few weeks.